Ossining, NY –How far can the bonds of family bend before they break? That will be the question Ossining’s Westchester Collaborative Theater (WCT) asks in Fractured Family Tales, its fall 2017 mainstage production and the premiere performance of four compelling one acts that tackle today’s trending topics through the lens of the family dynamic. The quartet offers an engrossing blend of hilarious farce, dark comedy, poignant lyricism and gut-wrenching drama, written by local award-winning playwrights and directed by celebrated NYU Tisch School of the Arts Professor Nathan Flower, known for his work Off Broadway, abroad and at various actor studios in Manhattan. Performance dates are: Friday evenings at 8 pm on November 17 and 24, December 1 and 8; Saturday evenings at 8 pm on November 18 and 25, December 2 and 9; Saturday matinees at 2 pm on November 18 and 25, December 2 and 9; Sunday matinees at 3 pm on November 19 and 26, December 3. Talkback sessions with the playwright and cast will follow the matinee performances on Sunday, November 26 at 3 pm and Saturday, December 9 at 2pm. The plays will be performed at WCT’s recently opened black box performance space at 23 Water Street in Ossining, NY. Limited seating; advance purchase is suggested. Tickets are $25 for general admission with discounts available for WCT members, seniors, students and groups of 4+. 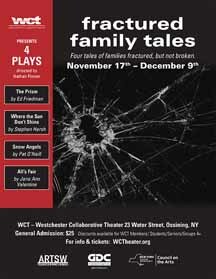 Purchase tickets online at wctheater.org. The Prism by Ed Friedman – A provocative yet tender examination of the aging experience that takes an unflinching swipe at our preconceived notions about race, religion, class and gender. Snow Angels by Pat O’Neill –A story uniquely suited to today’s headlines that plumbs the seeds of addiction with malice toward none by gradually uncovering hidden truths and revelations in a wintry father-son confrontation. All’s Fair by Jane Ann Valentine –A laugh out loud farce that tests love, trust, and everything in-between as a wife’s plans for a simple Birthday dinner with good friends dissolve under the gaze of a skeptical spouse. Ed Friedman’s plays have been staged throughout the metro area at various theaters including Gallery Players; Axial Theatre; and Village Playwrights. He is the co-founder and executive director of Lifetime Arts. Pat O’Neill, actor/playwright/director, recently won Best Play at the 2017 20/20 Aery Festival to overwhelming acclaim. Stephen Hersh won the 2015 New York New Works Theatre Festival competition as lyricist for Going Up?! The Musical, was a finalist in the 2015 Aery 20/20 Festival and won for Best Director. Jane Ann Valentine, actor/writer, won the 2016 Nor’ Eastern Playwriting Contest and the AAFilmLab’s Best Short Scriptwriting Contest. Flower has taught at Rutgers, the Actors Movement Studio, The Neighborhood Playhouse, Columbia University and the Maggie Flanigan Studio. His work has been seen off-Broadway and at BAM, Judson Church, Classic Stage Company, the Culture Project plus the Shakespeare Festival in Neuss-Germany and the Festival at Syros-Greece. He recently directed WCT’s staged reading of one act plays this past July. The WCT ensemble cast includes: Steve Allen, Dawn Brown-Berenson, Anne Glickman, Athena Glorius, Brenna Hughes, Lucas Kane, Erik Langner, Kurt Lauer, Tim McHale, Rahiem Wilson Morgan, Roberta G. Robinson, Dan Slavin, Wendy Temple and Lora Yuen. The WCT crew includes: Amor Barnardo, stage manager; Jeffrey Whittsett, lighting designer; Libby Brennesholtz; costume designer; Genevieve Tyler, set designer; and Julia LaVerde, running technician. Westchester Collaborative Theater is a multicultural, cooperative theater company located in Ossining, NY, dedicated to developing new work for the stage and bringing live theater to the community. It is comprised of local playwrights, actors, and directors who employ a Lab approach in which new stage works are nurtured through an iterative process of readings, critiques, and rewrites. When work is ready for production, it is produced for the public at our performance space. WCT is committed to furthering theater arts in our community. It is a 501(c)(3) non-profit corporation and a recipient of production grants from ArtsWestchester and New York State Council on the Arts.